We want to get all 72 Wisconsin counties activated for WIQP! This page provides information that we hope will help you plan your strategy in ways that will maximize activation. We hope you find this data useful for your planning purposes, but if you'd like something more, please let us know - we are open for suggestions on how to make it better. Once again there was activity in all 72 Wisconsin counties in 2018, but no logs were received from two of them. Twenty-seven counties (about 1/3) were activated only by mobiles - thank you mobiles! We'd sure like to see more fixed stations get on the air in these counties. This table shows activity by county for six years - 2013-2018. The Total Q's column is probably the best indication of activity in each county and the tables are sorted on that column. Note that, except for the last column, all data is based on the sent exchange information in the logs received. The Rcvd Q's column is the number of times that county was received by stations that submitted logs. Once again, thanks to everyone for doing such a great job of covering our counties, both fixed and mobile. WIQP would not be the same without you. Please keep up the good work - it is greatly appreciated! If you want to download the table data in Excel format, click here. 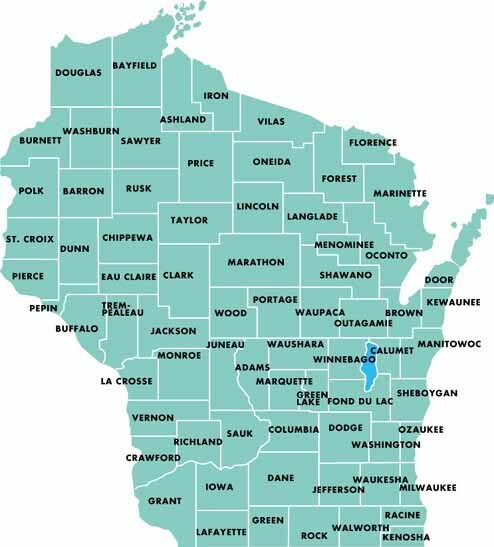 Also, if you need a detailed map of a Wisconsin county, check out the Wisconsin DOT website. And if you're not already a member, please join our Mailing List (email reflector) to catch announcements and some banter on what others have in mind in the weeks before WIQP.